We have another Solitaire game for iPad in the App Store. Apple approved Most Popular Solitaire, our third Solitaire game for iPad, yesterday; it is now available in the App Store for only $3.99! 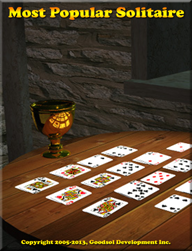 Most Popular Solitaire is a collection of 30 of the most popular Solitaire games, exactly as the title implies. These games include Klondike (a.k.a., “Solitaire”), FreeCell, and Spider, as well as more unusual forms of patience such as Crazy Quilt. There are games of many different types, including Pyramid, Forty Thieves, Aces Up, Canfield, Golf, La Belle Lucie, Cruel, Scorpion, and Yukon, plus 17 more games, and “if you act now” you will also receive 13 bonus variations of these games. The initial release of this latest app has the same basic features as A Little Solitaire Touch Edition and FreeCell Plus Touch Edition, albeit with many more games. The next two Solitaire apps from the Goodsol Solitaire for iPad page will add some additional features, based on customer feedback from the earlier releases. Get your copy from the App Store today! This entry was posted in Products and tagged card, game, iPad, software, Solitaire by Gregg. Bookmark the permalink.